SIPP unit for safe discharge of power grid transformer bunds. SKU: Sipp Node 2000. Category: SIPP Node. Here you find technical information and manuals for SIPP Node 2000. More information about the SIPP technology is available here. 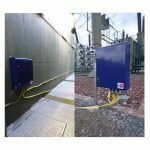 SIPP technology is an effective method for environmentally and quality assured discharge of oil-contaminated water from transformer oil catching bunds. Our solution for routine emptying of embankments and drainage sumps is designed on the basis of environmental safety water handling and the law of self-control. The device is well suited for medium-sized substations with multiple interconnected oil catch pits and catchment areas. SIPP Node 2000 continuously monitors the level of the transformer pit. – The SIPP unit starts emptying at a preset level, performs an internal leakage test and continues with the clearing process. Oil contamination levels is continuously measured throughout the entire process. If a level above the government approved figure occurs SIPP instantly redirects water back to the oil catching pit, ensuring that no water with oil content leaves the transformer bund. – SIPP technology measures the online oil content and logs continuously throughout the discharge process. SIPP unit for safe discharge of power grid transformer bunds. Capacity: 50 m3 / year.